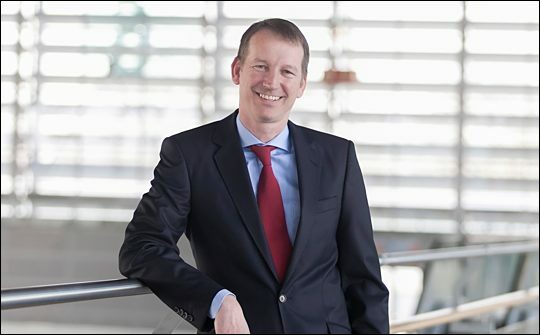 "If you know the exhibition venue of Messe Düsseldorf you will know the exhibition used to be in halls 1 to 7 but this year we are going to halls 9 to 17, which enables us to have a net space increase (to approx 67,000sqm) to cover the growing demand over the last two years of the exhibition. We are expecting 5,500 exhibitors this year; last year there were around 5,000 (a 10% increase). Exhibitors have been telling us “we need more space, we have some more exhibiting companies who want to attend” but this was a big discussion for us because it was crucial not to make too dramatic an increase rather more of an organic development. At the same time, we felt it is essential to meet the demands of the exhibitors, because otherwise it would be an open door for the competition. This year, I believe, we have found a good solution – one that we can retain for the next five to six years. We have good dates too – in the middle of March while avoiding Easter. So hopefully we now have a good chance over the next five or six years to stick to this situation and to go back to developing visitor targets – like bringing in more visitors from the US, Great Britain, and Asia – mainly Korea, Japan and, of course, China. The largest exhibitor participations once again come from Italy (approx. 1,350), France (approx. 1,250) and Germany (approx. 950). Also posting particularly strong growth are Australia, Spain and the US. After two years’ break, this year several Indian producers will be presented again while eight wine estates from Bolivia will be celebrating their premiere at ProWein. We have seen several countries that have started rather tiny at the first step, then they come back and they get bigger. If you think of the English, for example, two shows ago they first took a stand and they were extremely happy with it and have returned – this is their third year. That is really nice, so this year the new girl in town (so to speak) is Bolivia. There are spirits also to be found on many of the wine producers stands but there is also a dedicated spirits area for really specialised spirits, there is usually around 250 of these. We have up to 400 exhibitors in spirits generally. There is a nice bar in the spirits area too; called the Fizz Lounge. This year a bartender from Munich will be showing his latest mixology techniques with ideas about how to work dry fruits and spices, or smoke infusions into cocktails. We also have for the first time a special show called ‘Same but Different’ whereby we invite to the stage a number of small wine makers who are doing something special or different with their wines – perhaps in the production or marketing. One participant, for example, is a German guy who says “I don’t mind about parker points and all that stuff, I have my own ranking system with hats, I have one hat, two hats and three hats; and the three-hat wine is the best wine I make”. We have five thousand exhibitors who all believe “my product is so wonderful it speaks for itself - I don’t even have to care about special labeling”. Yes, they do wine and perhaps also spirits…they do the same as everyone else…but somehow in one or the other way they are doing it differently through their marketing, packaging or production methods. Therefore, we are putting on this special show for the very first time and hope that it not only acts as a platform for those participating, but also raises discussion about how to stand out from the crowd by doing something different. The way participating winemakers and projects explore new avenues does vary – no two concepts are the same. This line-up, for instance, includes Lukas Krauß, a young winemaker from the Pfalz region, who in tune with his trademark headgear divides his wines into ‘hat categories’ and who has hit the headlines with his Pornfelder wine (a cuvée of Portuguese and Dornfelder). Michael Spreckelmeyer is also familiar with headlines – especially with heavy metal bands and other musicians. Under the heading “Metal and Wine” this Düsseldorf local markets the wine of rock stars. He brings bands and winemakers together, gives advice and takes care of sales and merchandising. Taking new paths in the truest sense of the word are Ilse and Roelof Visscher who not only cultivate wine around their winery in the Netherlands but now also in the Caribbean: using crowd funding they are financing their new wine cultivation project on the island of Curacao. Travelling to ProWein 2015, not from the Caribbean but from South Africa, are representatives from uniWines. Their “Palesa” line of wines are Fairtrade products inspired by the passion and strength of African women and mothers. The proceeds from Palesa are used to fund corresponding social projects in the region. Hosted presentations of the individual projects and personalities will run at repeated times on each day of the fair. That is the idea and we hope it will follow on next year with more ‘Same but Different’ projects or personalities. This year we have around 10 participating and we are presenting them one-by-one on Facebook. It should be a very interesting spot, we hope. We wanted to create right from the start a truly international platform for wines – not to be seen as the German show because it’s in held Düsseldorf, but one that sees for example a Canadian buyer who comes to Düsseldorf and gets in contact with an Australian wine maker. These are the strengths we have, which come from the huge industry shows we have been organizing for decades, such as Drupa and Interpack, creating a network with over 70 offices. So when it came to the first days of ProWein 20 years ago, we thought: OK that is the concept, we use our international network in all the wine producing countries and say to winemakers ‘come on now promote the your wines’. That is the huge difference between Düsseldorf and Bordeaux or Verona…they are mainly driven by the national wine makers. We have developed a completely different approach to them, which has made it easier than to be so successful."